POTENTIAL DUAL LIVING ONE STREET FROM WATER! 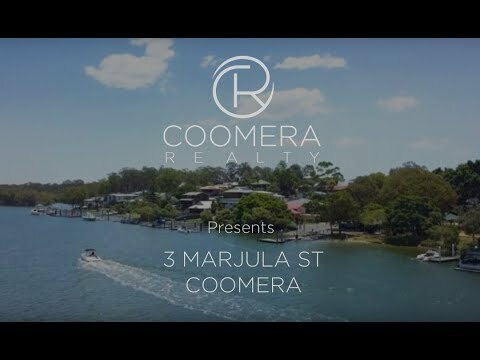 Enjoy the best of lifestyle living in the quiet and secluded pocket of Coomera Shores. Rewind the clock and appreciate large blocks, unique homes, wide streets and an area the whole family can love. Coomera Shores is an established neighbourhood that captures the lifestyle of the true boatie. With great fishing on the Coomera River just at the end of your street, a boat ramp at your door, and a huge lifestyle park down the road, this five bedroom modern home caters for the 'life be in it' buyer. If you have a Big Family, Extended Family, Growing Family, a Family that never want to fly the coop… or just love room to move this is the home for you. • On the lower level you will find the perfect arrangement for dual living. This wheelchair friendly space offers a large open bathroom which doubles as a spacious laundry room, a spacious and private bedroom with large windows, sliding doors on the alfresco and ceiling fan. • Living space is in wonderful supply as this area hosts a spacious lounge room and dining area along with room to easily build in a kitchenette for complete self-contained accommodation. • The whole room opens onto the under deck alfresco area which runs the full length of the home and offers views over the private backyard. • Upstairs hosts the remaining 4 bedrooms or 3 + Study as two children’s rooms host mirrored wardrobes whilst the third can be utilised as a bedroom or multi–use area. Each room also hosts large windows and ceiling fans. • The master bedroom has a large walk in fully fitout wardrobe along with a private ensuite and large sliding door onto the rear deck and views out to the Hinterland. • The home has been designed for the modern family as the kitchen area is central to the open plan lounge and dining area. This whole space can be arranged to fit your needs with interchangeable spaces and windows on every wall to take in the view of the surrounding mountain scape and a vista over the Coomera River. • Natural light floods the home, draws the outdoors in and can all be enjoyed from the comfort of this galley kitchen. With gas cooking, dishwasher, triple fridge space and corner walk in pantry, this kitchen is an effortless design that makes cooking easy and keeps the chef right in the middle of family life. • The entire upper level is accompanied by the expansive rear deck that runs the length of the home and offers the best place to relax, entertain and of course take in the surrounding views… especially at sunset! Externally the property offers so much secure space for up to 6/7 cars or a jet ski, boat, caravan, motor bike, trucks - if you need the space for it, this is the property for you! A huge double lock up garage offers additional space to the rear along with floor to ceiling storage and huge under stair storage (ideal for a wine cellar). There is also a double carport with roller door and added open aired parking bays inside the front fence. The hobby enthusiast will love the gated side access with concrete driveway through to yet another carport/man cave that can be utilised as storage, tool shed, green house or beer on tap and the footy playing on the wall… a space to call your own! The large elevated 620m2 block has a private backyard and plenty of room for a swimming pool, jungle gym or garden to your hearts content! Additionally you will find, split system air conditioning, security screens, huge amounts of added storage, a large main bathroom with spa bath! Colorbond roofing, full steel frame construction perfect for QLD pests, recently painted, new window furnishings, bio cycle septic system, approximately 20,000 ltr inground water tank (although as time has progressed town water and sewerage is now available for straightforward connection) and so much more! Rarely an opportunity like this presents itself to buyers at such an unbeatable price! With access to the main Broadwater and the seaway at your fingertips, this home has abundance of character and privacy. Located in a selective and secluded residential pocket, Coomera Shores is an exceptional region that provides a certain calibre of leisure lifestyle!